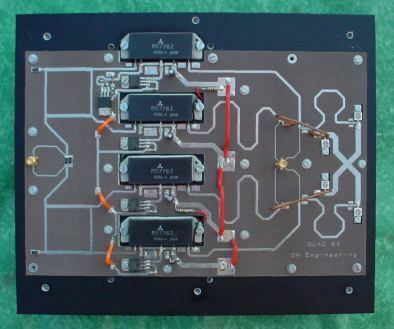 The GH 'Quad' is a solid state amplifier utilising four Mitsubishi M57762 PA modules to give up to 75W output in the frequency range 1240 - 1300 MHz for CW/FM/ATV use with a drive of 3-4W. For SSB, the Quad will provide approximately 55-60W linear output for a drive of approximately 1.2-1.5W. Driving the modules harder will result in more output power, but will distort the outout signal. The Quad will initially be available in a mini-kit, which will include the un-drilled heatsink, PCB, mounting plate, screws and all the electronic components. It will not include a case, input/output connectors, internal RF cables, DC connectors, PTT connector, power-on LED etc as most experienced constructors will already be able to supply these. However, GH engineering is able to supply most of the extra components required to build a complete amplifier. A custom case will be designed in the near future, and then a full kit will be made available. An external DC power supply is required with an output of 12.5 - 13.8V at a current of up to 20A. There is a lot of mechanical construction required, and GH Engineering is able to supply the Quad in any state of build, such as pre-drilled/tapped heatsink - details on request. Also, all the parts can be sold seperately, and the kit can be supplied without the modules if required. Assembly drawings and draft construction notes are available by clicking on the links below, as is a note relating to mounting the Quad at the masthead.